This Bubble Up Cheesy Chicken and Broccoli Bake is a super easy comfort food meal, perfect for a weeknight dinner. I know you all love bubble up casseroles and I was in the mood for something cheesy, so this was the delicious result. This cheese sauce, y’all…it’s so good. Plus, my 10 month old has been avoiding vegetables since we transferred her from purees to pick-up foods, but she LOVES cheese (chip off the ol’ block), so I figured maybe coating broccoli in cheddar cheese sauce would bring her around. This recipe comes together really quickly; you just whip up a quick cheese sauce, steam some broccoli in the microwave, stir everything together and bake! I do use cooked chicken in this recipe, which you can make ahead in your slow cooker, pressure cooker, oven, grill, or just use a rotisserie breast with the skin removed. Whatever you prefer! 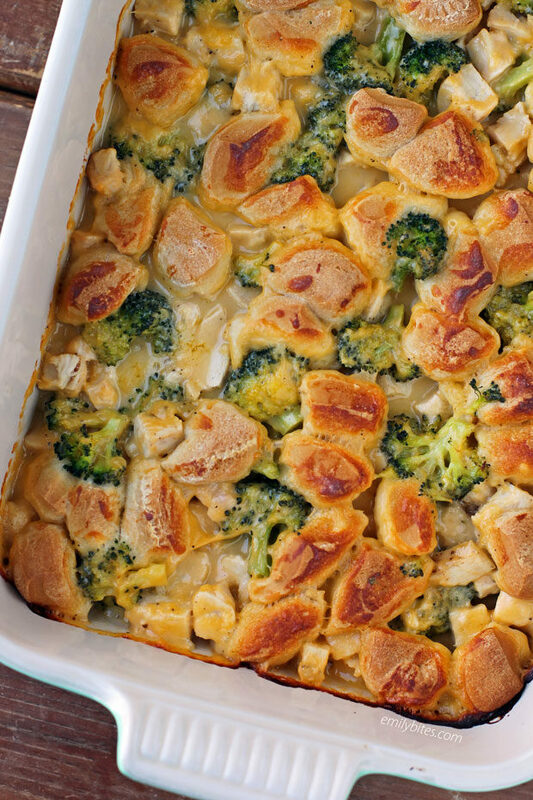 This Bubble Up Cheesy Chicken and Broccoli Bake gives to hearty chicken, healthy broccoli, and puffy biscuit pieces all smothered in a creamy cheese sauce for just 350 calories or 7 WW Freestyle SmartPoints. Just to answer a question I’ve received a few times on my bubble up casseroles since Weight Watchers’ transition to Freestyle, I haven’t tried making these with 2-ingredient dough yet (in place of the biscuit dough). The Wegmans brand biscuits I use are super easy and low in calories/points (I think the Pillsbury ones might be slightly more?) so I find them really convenient in these dishes. I have, however, heard from a few readers who tried making bubble ups using 2-ingredient dough (equal parts plain, nonfat Greek yogurt and self-rising flour) and said they were a success, so feel free to give it a try and report back with your results! Looking for more lightened up comfort food casseroles? Check out my Bubble Up BBQ Chicken and Beans Bake, Cheesy Buffalo Chicken Chickpea Bake, Meat and Potatoes Bake, Spinach and Chicken Phyllo Bake, Bubble Up Chicken Alfredo Bake, Cottage Pie, One-Pot Cincinnati Chili Spaghetti Bake, Cheesy Buffalo Chicken Potato Bake, Chili Cornbread Bake, Bubble Up Pizza Casserole, Layered Chicken Enchilada Bake, Teriyaki Chicken and Rice Casserole, Eggplant Parmesan Casserole, Bubble Up Chicken Pot Pie Casserole, Chicken Parmesan Quinoa Bake, Deep Dish Sloppy Joe Casserole and many more in the Casseroles section of my recipe index! Preheat the oven to 350 degrees. Lightly mist a 9×13 casserole dish with cooking spray and set aside. Place the butter in a medium saucepan and bring over medium-low heat until the butter is melted. Add the flour, salt and black pepper to the butter and stir to combine. Add the milk a little at a time and whisk the flour mixture into the milk each time until smooth. Turn the heat up to medium and add the shredded cheeses. Whisk together and then whisk on and off for 3-5 minutes until smooth and thickened and remove from heat. 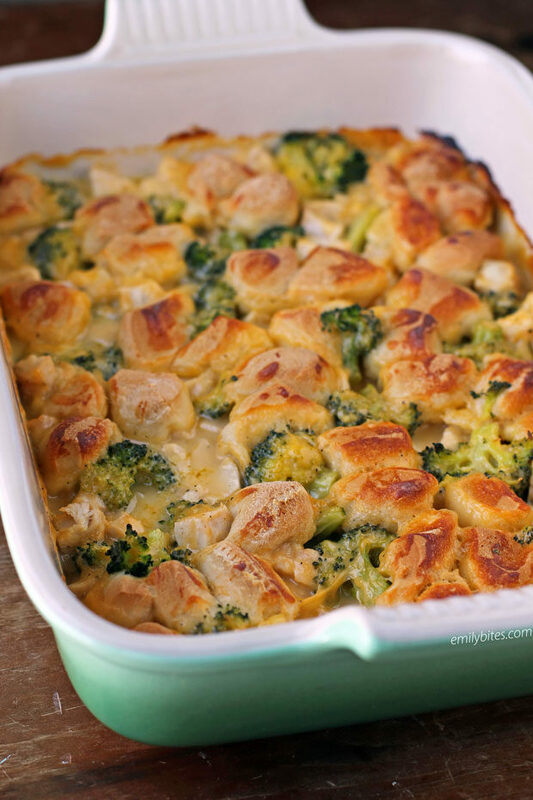 Place the chicken, broccoli, and cheese sauce in the baking dish and stir together until combined. Add the biscuit pieces and stir in to coat. Bake for 40 minutes until the casserole is hot and the biscuits have bubbled up. Let cool for 5-10 minutes. Slice into 6 pieces and serve. This looks awesome! Quick question: do you mean 16 oz raw chicken or 16 oz cooked chicken? I realize to put it into the casserole cooked, not raw, but since 16 oz raw is about 12 oz cooked, I just want to make sure I use the right amount! This was a great starting point for me. I had green beans, not broc. That was fine. I can not use milk, so used flour and chicken broth, and left out the butter. I used fat free cheddar cheese from Walmart. It was good, but did not melt great, and was not very sharp. Next time I will use 1/2 low fat cheddar and 1/2 fat free. My husband was very impressed and it will be put on our rotation ! I used Trader Joe’s Lite Mozzarella; didn’t have any reduced-fat cheddar on hand. Also used the 2 ingredient dough as that has been my jive lately. My husband and picky 9-year-old daughter loved it; there were no leftovers! I put everything in the WW app (minus the 2 ingredient dough) and it came out to 4 SP for a quarter of a 9×13 dish. I only used one batch of the 2 ingredient dough (1 cup plain FF Greek yogurt, 1 cup self-rising flour), and cut it into 7 “biscuits”. I would think it would still stay at 4 SP for what I ate. I will definitely make this again, maybe not as much cheese, it seemed salty. I will place dough on top. I did mix it in as the recipe said, and some biscuits didn’t brown. My family loved this recipe so much. Thank you for sharing it! I added frozen corn and riced cauliflower to make it more filling without adding points. Also added garlic and onion. Yum! I made this tonight. It is delicious! Only think I did differently was I added a bit of high quality granulated garlic to the cheese sauce mixture. Yummy! When I added this into the recipe builder, it came out as 9 Smart Points. Did I do something wrong?